In most cases, when it comes to maximising space in a warehouse or storage facility, the focus is heavily centred upon the ground floor. Reconfiguring operations in this area makes sense, of course, but consideration should always be given to the vertical space within the building. Mezzanine flooring is the ideal solution for companies working in constricted spaces who need to expand but are not in a position to consider moving to larger premises. In this blog we’ll talk through how mezzanine flooring can add significant benefits to the logistics in your warehouse. Storage needs are an ongoing issue in any successful retail business and mezzanine flooring offers a relatively cheap and easy solution. This is the primary reason why people look at purchasing this particular style of storage. Large warehouses in particular benefit as they begin to make use of the empty space that has been going to waste for quite some time. The height of the facility will dictate how many floors can be added but mezzanine flooring allows you to capitalise on the full area under your control. The continued growth of online retailing is producing an interesting conundrum for a number of businesses. Price competition is fierce and the need to minimise overheads is key to remaining competitive. Yet sustained order growth creates the need to expand to keep up with demand. Moving is a cost all in itself, let alone taking on the financial weight of a new warehouse. The installation of mezzanine flooring shouldn’t be viewed as a short-term fix. However, if you do reach the point where even this is not sufficient, then you may be more ready for that move than you believe. The simple construction of mezzanine flooring is reflected in its cost. It is a reliable and cost effective way to maximise the workspace. It not only creates extra capacity but increases efficiency and provides a positive knock-on effect to the organisation in the areas that have been relieved of unsustainable storage. Small businesses benefit enormously from this option, successfully planning incremental expansion without unnecessary investment. Regulations and rules in this area have been tightened significantly over the past couple of decades, much to the benefit of the staff who work there. Mezzanine floors offer an ideal vantage point for supervisors and managers to get a full overview on any potential dangers occurring within the warehouse. It also provides a visual view of the product flow in and out of the facility, which can prove to be a valuable way of making small but meaningful changes to work processes. The flexibility of mezzanine flooring allows it to be used for more than just storage space. Growth within a company means more than just finding extra space to store more goods. Increased product demand requires more warehouse staff and office workers to maintain the back office administrative side of the business. If office space is limited, mezzanine flooring can be utilised to create new workspace too. It can be designed and function in the same way as any other office space and presents a practical long-term solution for the business. The installation of mezzanine flooring can work for warehouses of any size. For those in need of creative solutions on a tight budget, this is likely to be an option worth considering. Rather than be cornered into moving the business or expanding at an unnecessary rate, this style of storage will help to maximise the potential of your current storage space. And with the option to construct muli-level mezzanine flooring, the sky really is the limit. Often when businesses grow they face challenges with floor space. Two tier or mezzanine floor installation can provide the additional space by doubling an area of floor space. The two main options are a conventional mezzanine floor of a two tier pallet racking or shelving system typically used for product dispatch applications. We specialise in designing and installing multi-tiered picking and dispatch systems for hand picking offering a complete solution for the structure and semi-automatic and gravity picking solutions. We can advise, design and install the structural element, picking systems and conveyors to complete the process. We help you by looking at product and inventory as well as the dispatch process and procedures to optimise pick rates and pick accuracy. If you are considering changing your dispatch process and are interested in a two tier or mezzanine floor installation, call us today, for free and independent advice on the best type of semi-automatic and manual picking and dispatch systems. Do you need a mezzanine floor for a shop or retail outlet? We specialise in mezzanine floors for retail shops using the associated fire protection and building regulations. So if you are looking for the most cost effective solution to expand your retail area we could save you the costs of moving or leasing a larger retail premises. Mezzanine floors are an independent free standing structure that can be removed and transported to a new location in the future. They are often the most cost effective way to increase retail floor space and also offer a relatively quick and easy way to increase the floor space of your building. They can be specified with chrome and glass hand rails and balconies making them a valuable addition to businesses in retail and leisure environments. We offer a FREE DESIGN and BUILDING REGULATIONS consultation at your location so if you need more space call us today for a competitive and cost effective mezzanine floor. How much does a mezzanine floor cost per square meter or square foot? Mezzanine floor costs are similar to building costs per square meter in that although people do used square meterage costs for provisional or budgets prices they do vary dramatically. There are many things that affect the price of a mezzanine floors with size and specification being the obvious. The finished floor height often called the mezzanine FFL finished floor level will affect the cost and square meterage price as will the CUF or clear underfloor height. 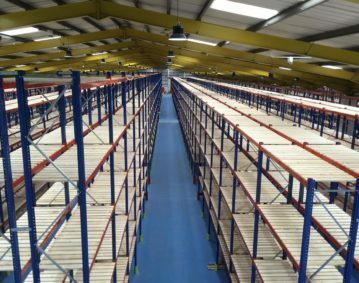 One that is often overlooked by people when price shopping for mezzanine floors is the loadings, you may get a quote for a low rated mezzanine suitable for light storage only. If you add people working on the mezzanine using pallet trucks and add shelving or racking for mezzanine floors the loadings may need to be upgraded affecting the cost. Another item that is often overlooked is the GRID this is the structural layout of the mezzanine floor and dependant on the structural loadings, structural calculations and structural design grids will vary. This impacts the number and positions of the columns and these can affect the usefulness of the area under the mezzanine floor. The type length and specification of handrail including kick boarding and knee rails can dramatically affect the cost and look of a mezzanine floor. The deck finish if it is simply left as chipboard or requires a covering of chequer plate or polyfloor will again increase the cost as will items like pallet gates number, size and specification. Building regulations compliance can have a big effect on prices with the addition of fire rating to columns and fire protection to the underside of the mezzanine floors. The number and type of staircases will of course have a large impact on prices. The specification of mezzanine floor staircases has changed in recent years so make sure that your mezzanine floor suppliers are fitting the correct type and number of staircases to meet the current UK building regulations. Are you looking for Mezzanine floor suppliers Yorkshire? If you are short of space a mezzanine floor is often the most cost effective solution in comparison with moving or extending your building. Here at 2h storage we are one of the Norths leading suppliers of mezzanine floors these are usually designed and specified as a mezzanine floor storage area, mezzanine floor production area, or mezzanine floor office. We take care of the entire design and build of mezzanine floor installations preparing full CAD drawings, liaising with building control then manufacturing the floor in component form for erection and installation on site. Our site team will then assemble, erect and build your new mezzanine floor on site. We can also take care of any fitting out or partition works or associated products like pallet gates, conveyors, shelving or storage boxes. If you are looking for a reliable contractor who is a member of the safe contractors scheme to supply your mezzanine floor please call our design team on 01765 640 160. Mezzanine floors require building regulations approval and are covered by a number of the different parts of the UK building regulations. For instance mezzanine floors building regulations fall under part “A” of the UK building regulations covering structural issues and they will require the calculations of a structural engineer to satisfy the building inspector of the mezzanine floors structural integrity. You will also need to consider part “B” fire safety so there may be the need for additional call points and the consideration of travel distances. With part “K” covering staircases also often playing a critical role in the designs of mezzanine floors. If you are having areas above or below the mezzanine fitted out as office mezzanines or for production or storage you will fall under additional regulations are additional items and measures may be required to meet the mezzanine floor building regulations. The key is to provide a suitable design that negates the needs for unnecessary and costly additions to the mezzanine floor design while still meeting the required regulations and keeping your team and visitors safe. Here at 2h Storage unlike many of our competitors we look after this aspect of the build on your behalf saving the need for additional and costly professional fees. Needs Mezzanine Floor Alterations? Mezzanine floors are a popular and effective addition to most industrial buildings and offer ideal accommodation for office mezzanines, production mezzanines and storage mezzanines. Businesses often need to alter or extend mezzanine floors as production or the number of staff increases. Here at 2h Storage we can help you by drawing on our years of experience of designing mezzanine floors. We can provide a new mezzanine from scratch taking care of all the aspects of the mezzanine project from design, building regulations through to office fit outs. Or perhaps you need to alter or extend an existing mezzanine? We have many satisfied customers and you can see examples of our existing floors in a working environment. We have dismantled and re-erected existing mezzanine floors in existing buildings or moved them between sites.